San Diego, California to Alaska. Cape Arago, Oregon, USA. 35 mm long, collected from the rocky intertidal. Photo: Jeff Goddard. This delicate and translucent arminacean is an opportunistic predator capable of feeding on a wide variety of prey, including arborescent and foliose bryozoans, small prosobranchs and crustaceans, hydroids and ascidians (Robilliard, 1971; Goddard, 1998, personal observations). Robilliard (1971) observed it tending to specialize on either bryozoans or small snails in two different habitats, depending on which prey item was most abundant. Dirona albolineata ranges from San Diego, California to Alaska and reaches 180 mm in length (Behrens, 1991). See message on copepod parasites. • Behrens, D.W. 1991. Pacific Coast Nudibranchs. Sea Challengers: Monterey, California. • Goddard, J.H.R. 1998. A summary of the prey of nudibranch molluscs from Cape Arago, Oregon. Opisthobranch Newsletter, 24: 11-14. • Robilliard, G.A. (1971) Predation by the nudibranch Dirona albolineata on three species of prosobranchs. Pacific Science, 25: 429-435. 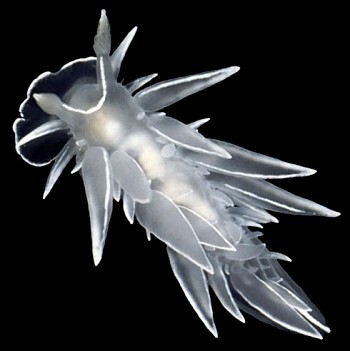 Unknown White Nudibranch..looks like an angel!